The rise of the British accountancy profession from the late nineteenth century to the present day, and the world-wide success of its accountancy firms, were to a large extent based on the growth of the audit function. 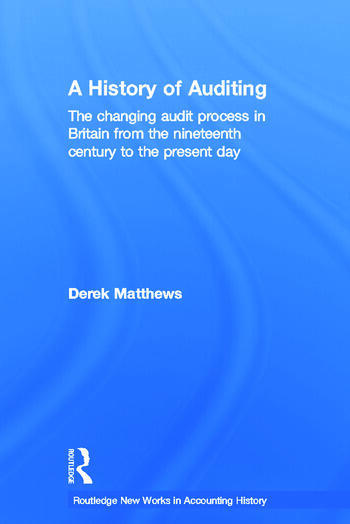 This book explores the history of the audit process in Britain, demonstrating that the characteristic features of the auditing industry are a diversity in practice based largely on the different types of clients the auditors serve. The book examines the innovation that was brought about by the staggering developments in information technology which have been seen over the last few centuries. This comprehensive history will be a useful reference tool for accounting, business and economic historians and will also be an enlightening read for all those with an interest in auditing procedures. Derek Matthews is Reader in Economic and Business History at Cardiff University, UK. 'The great strength of this book is its firm basis in the evidence provided by the author’s postal questionnaire and interviews. This book’s central contribution is in its richly nuanced account of audit practices, showing how change was not a uniform process, but took place at different rates in different parts of the audit market.